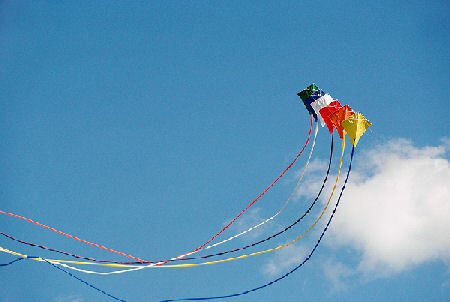 ​​Take some tissue or crepe paper streamers outdoors to test for wind. Explore an electric fan (supervised). Place various items in front of it, and find out if they blow away when the fan is turned on (e.g. paper, foil, ball, tissue, rock, leaves, toy, etc). Try it with different speeds. How far do they go? Have the children try blowing the items with their mouth. Blow cotton balls or tissue crumples across a table with your mouth, or through a straw. Set up distance “markers” on the table – did your cotton ball go as far as the block? Not as far as the scissors? Beyond the teddy? Older children use a tape measure. Make a “wind-catcher” by tying each end of a piece of yarn to the two handles of a plastic grocery bag. Take it outside on a windy day to “catch the wind”. Simply speaking, wind is moving air. Wind can make other things move. What things have you seen the wind moving? The power of blowing wind moving things can be called “energy”. Sometimes wind energy can make machines work, to make things easier and faster for people. An example of wind creating energy is a windmill. Wind is invisible, just as air is. However, we can see the things that are moved by wind, and the effects of it. How can we tell if the wind is blowing? ​​Blow a blob of diluted liquid watercolor in different directions across a paper. Keep a feather in the air by blowing it. How long? Purchase or make wind chimes. Make a simple windsock by creating a tube with a piece of construction paper, decorating it, taping streamers around the bottom, and a yarn handle at the top.